French doors can provide an elegant entryway, with their rows of windows set into double doors. When you have steel French doors, you have the added benefit of low maintenance door materials that will stay beautiful for years. Paint steel French doors when you wish to change their color, preparing the surface first and applying the appropriate paint evenly over the surface. French doors let the light in to your interior spaces. Saturate the old cloth with mineral spirits and wipe down the steel surfaces of the doors thoroughly to clean them. Allow the door surfaces to dry completely. Sand every surface of the doors evenly with the sandpaper to create a slightly scuffed surface. This will help the paint adhere more effectively to the doors. Wipe the door surfaces with the tack cloth to remove dust from sanding. Apply painter’s tape around the perimeters of the glass panes of the French doors to prevent primer and paint from seeping onto the glass while you paint. Apply painter’s tape over the metal hardware of the doors, including hinges and doorknobs. Load the 1-inch paintbrush with primer and apply the primer evenly over the surface of the French doors. Paint each rung between the glass windows carefully to coat the steel with an even layer of primer. Load the 2-inch paintbrush and paint the top edges of the doors, the narrow side edges and the flat portions of the doors above and below the windows. Allow the primer to dry for the time recommended on the primer label. 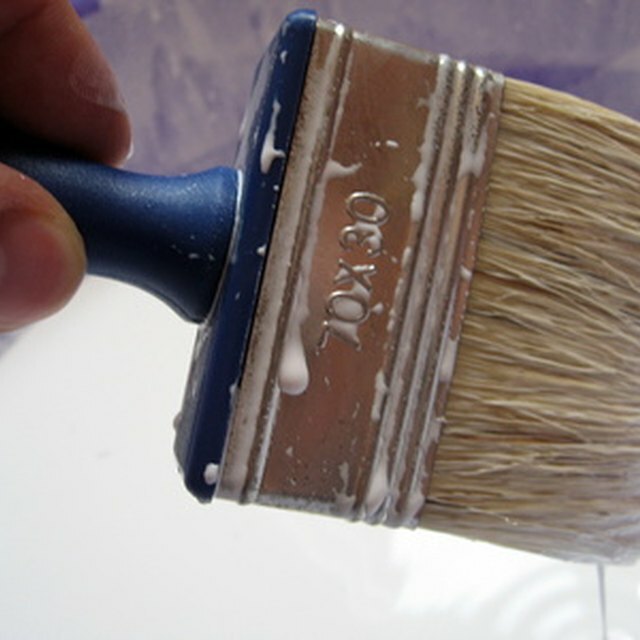 Load the 1-inch paintbrush with paint and apply the paint in the same manner in which you applied the primer. Allow the paint to dry for the time recommended by the manufacturer and then apply a second coat of paint. Allow the second coat of paint to dry for the same recommended time. Remove the painter’s tape carefully. Schedule your painting job for when the air and surface temperatures fall between 50 and 90 degrees Fahrenheit to ensure the best paint adherence. Log Home Living; Active Interest Media Inc.